Back in the Turtles’ Lair in New York City, Splinter is trying to reach his sons via meditation. In South America, the Turtles, April, Jagwar and Dreadmon are hiding from a helicopter being piloted by Kid Terra. Kid’s boss, Null, contacts him and orders him to go oversee the Deepdump Operation, as he’s heard complaints of other mutant activity there. The Turtles celebrate their narrow escape and head to the beach, only to discover it covered in litter (ugh! ), so Don gets an idea and starts cobbling all the trash together. As Mike surfs some mondo wave-itude, Jagwar and Dreadmon gather up some fruits for lunch. Eventually, Don unveils his latest creations: a pair of inner-tubes powered by old outboard motors. The Turtles and April then bid their goodbyes to Jagwar and Dreadmon and take to the high seas. After going a couple hundred miles out, they eventually spot land. April, Mike and Don decide to swim the rest of the way, freeing sea turtles from plastic six-pack holders along the way (gah!). Raph and Leo park the inner-tubes and share the feeling that Splinter is watching over them. Their touching moment of male bonding is quickly interrupted as they turn around and find their friends held in the grip of a giant high-tech submersible with robotic grappler arms. The submersible pimp-slaps the two of them and then proceeds to toss everyone inside itself before diving down to a deep sea facility. Man-Ray tells them that his weird little friend is a Glublub named Bubbla and then proceeds to spin his yarn about what he’s doing in an under sea prison. 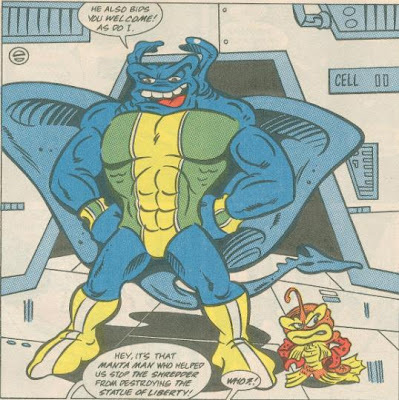 Apparently, after helping them stop the Shredder from destroying the Statue of Liberty, Man Ray swam out to sea to learn about his new powers (such as his amphibious nature and echo-locating abilities). Man Ray eventually met up with Bubbla, who took him to the undersea civilization of Glublubs. The Glublubs were suffering from a strange sickness which turned out to be radiation poisoning caused by illegal toxic waste dumping (Jeez!). No sooner had Man Ray and Bubbla discovered the dumping operation, they were taken prisoner by the submersible machines piloted by the Oceanauts. After suffering through Man Ray’s yammering, Leo asks if he can use his echo-locating powers to check the thickness of the walls. Man Ray discovers a two-way mirror, which Leo and Don promptly break by hurling Mike through it shell-first. 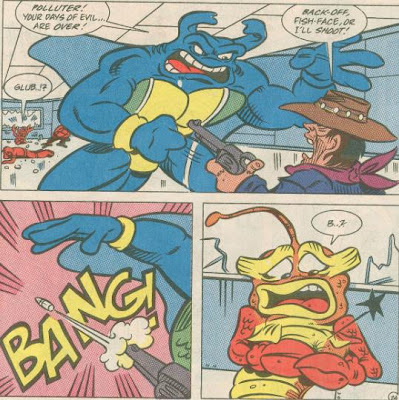 The Turtles encounter Kid Terra, who tells his goons to take the Turtles alive for Null. The Turtles make short work of the goons, leaving Kid Terra in a one-on-one battle with Man Ray. Kid whips out his pistol and fires at Man Ray, only to miss and hit Bubbla. Enraged at Bubbla’s death, Man Ray goes berserk and tears apart the Deepdump facility. Kid Terra and his henchmen manage to escape via submersible, while the Turtles and April jump into the moon pool and swim for it. Luckily, the group of sea turtles they helped earlier are present and give them a lift back to the surface. 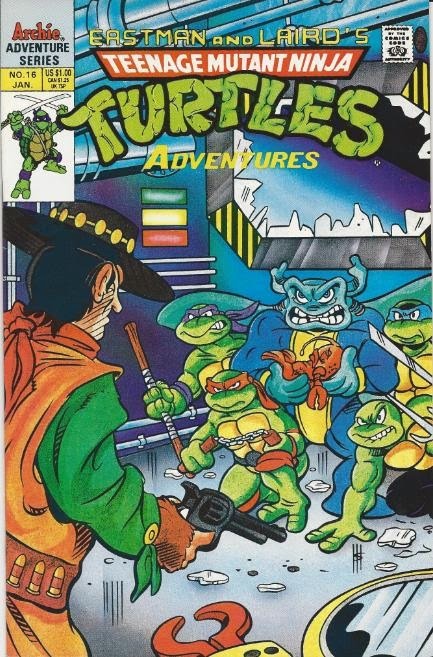 *This story is continued from TMNT Adventures #15. This story continues in TMNT Adventures #17. *A day after Bubbla's funeral, the Turtles, April and Man Ray will encounter a ship of ghost pirates in "Red Sails in the Sunset". *Splinter hasn’t been seen since TMNT Adventures #10. *Chronologically, Man Ray was last seen in "Yo-Ho-Ho! And a Bottle of Mutagen!". *The remains of the Deepdump base will be revisited in Mighty Mutanimals #7. *Glublub is actually based on a small “partner” toy packaged with the Ray Fillet action figure from Playmates. Many TMNT toys had smaller, articulation-less partner toys with next to no paint applications, such as Screwloose and Joe Eyeball, for example. *This issue was published in the UK by Fleetway in TMHT Adventures #26. Well, the uber-preachy South American tour arc is almost over; just one issue to suffer through after this one. The annoying public service announcements wouldn’t have been so bad if Brown and Clarrain (Murphy) had maybe spread them out over several non-consecutive issues instead of beating us over the head with four issues of it in a row. But hey, Man Ray’s back! And his little plastic partner toy is with him! Well, not for very long, anyway. 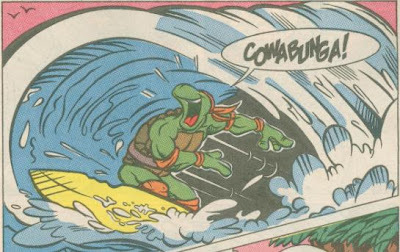 The death of Bubbla was a pretty ballsy maneuver for a kid’s comic and a fine example of what TMNT Adventures could get away with that the cartoon series couldn’t. You don’t exactly feel too much for Bubbla when he dies, since he didn’t have any actual depth; it’s more a character piece for Kid Terra. Kid Terra will proceed to undergo an interesting character progression, with his actions in this issue haunting him throughout it. Dreadmon and Jagwar disappear almost as abruptly as they came. Without any origins, their participation in this story arc felt fairly superfluous. It’s like they were only introduced to bolster the roster of the upcoming Mighty Mutanimals. This lack of depth will eventually be rectified in the Mutanimals series, but so far as it stands right here, the pair were woefully dull guest stars.